In this post, I'll show how to setup Scout to monitor the performance of SQL queries, external HTTP calls, template rendering, and more in Wagtail, a Django CMS app. Wagtail is a fast, modern opensource content management system built on Django. Used at NASA, Google, MIT, and more, it's a great option for running your own CMS. When we add the scout-apm package to the app, we'll quickly gain insights on the app's performance. I'll start with the performance monitoring basics, then move onto advanced settings we've found valuable for monitoring our own apps at Scout. Scout is distributed via the scout-apm Python package and configuration takes just a couple of lines of code. Once configured, Scout auto-instruments Django apps, tracking the performance of individual web requests, SQL queries, and more. If you don't have a Scout account, signup for a 14-day trial. After signup, follow our Django install instructions. Add 'scout_apm.django' to the top of the list of INSTALLED_APPS. Scout aggregates metrics by the application name. It's useful to separate your apps by environment as your dev environment often behaves very differently than production. I set unique names for dev and production environments. SCOUT_NAME = SCOUT_NAME + " [DEV]"
SCOUT_NAME = SCOUT_NAME + " [PROD]"
If you prefer to keep your API keys out of version control, you can set a SCOUT_KEY environment variable instead. The Scout agent will use this key when reporting metrics. Remove SCOUT_KEY from base.py to avoid confusion. That's it! Just run python manage.py runserver to start your app server, send some requests to your app, and verify your Wagtail app appears in Scout. Scout's basic installation automatically tracks SQL, view, and rendering performance. Changes to our app can trigger performance issues. 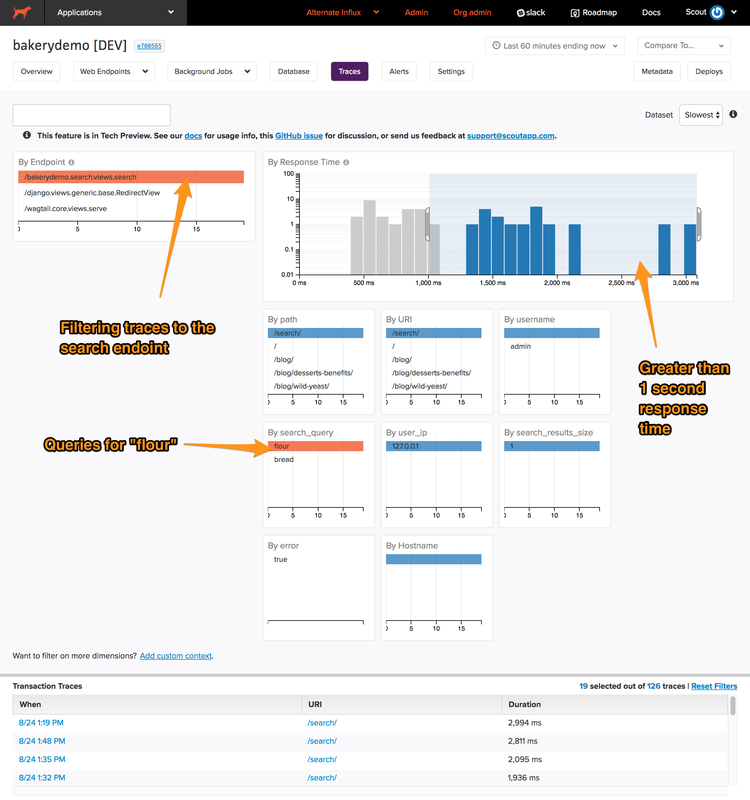 After configuring deploy tracking, it's easy to correlate these changes to performance. When combined with the GitHub integration, we can also view a diff of changes between deploys. Scout's GitHub integration enriches deploy tracking, providing a diff summary of changes when you mouseover a deploy marker or the Git SHA next to your app name. This alert will be emailed to users of our choice. Many performance issues aren't experienced by everyone: they are triggered in specific situations. For example, a power user accessing a lot of data is more likely to see slower response times. Sometimes this performance profile may be hidden in overview metrics. Last but not least, Scout instruments many popular Python libraries, but not your custom code. For this, you can add custom instrumentation. Scout makes monitoring the performance of Django apps affordable and approachable in just a couple of lines of code. In this walkthrough, I've added Scout to Wagtail, an opensource Django CMS. You can find my modifications to the Wagtail Bakerydemo app on GitHub. Try Scout for Django monitoring today with our 14-day, credit card-less trial.